crashnotes: look who I got to hang out with yesterday! I got to briefly meet Mel's hubby Andy in the Kroger parking lot (where this pic was took...I thought about lying and saying it was on the UofM campus but I think it's even better in a grocery store parking lot :p) Had so much fun with Melanie...like we've known each other for years (well, I guess technically we *have* but never in real life!) I'm so glad we got a chance to hang out and I'm REALLY hoping that her and Andy's future is in Michigan. Heading to the pumpkin patch today so hopefully I'll have some good photos to share tomorrow! Have a great weekend all! Wow. You should really check out that Nascar blog. It sounds VERY exciting. That is super cool that you got to meet Melanie. Too bad she couldn't have come next weekend and we all could have cropped. It's official I signed up. Have fun at the Pumpkin Patch. Which one are you going to? We always go to Westview Orchards. It's just not Halloween without a $40 pumpkin. Oh, how fun for you!!! LOVE that nun - that is hilarious!! And she spits fire?! We went to the patch today too! I love this time of year! How fun!! Shopping and playing all day with Mel - what a blast! So fun that you two were able to meet up! Glad you had a good day! Hugs! $40 for a pumpkin???? Tell Ashley she got hosed!!! whoa!!! Have fun at the PP tomorrow- jealous about that too, since we have had nothing but rain, rain and more rain since October started. I haven't taken one single leaf-y/fallish pic yet. And tomorrow it's supposed to be really windy, so there might not be a leaf left on the trees, argh! Take lots'O pics!! okay. how much fun did you girls have?? color me jealous!!! super cute pic too! GREAT pic of the two of you. And sounds like you had FUN :) yay for a girl's day out! Look at you two....what a fab picture! Sounds like an awesome trip together....shopping (and no kids?!) eating out....fun fun! Pumpkin Patch....jealous here! Today is the 1st day of sun in like 9 or 10 days....not just no sun but rain! How neat that you and Mel got to meet! Isn't she sooooo tall?! 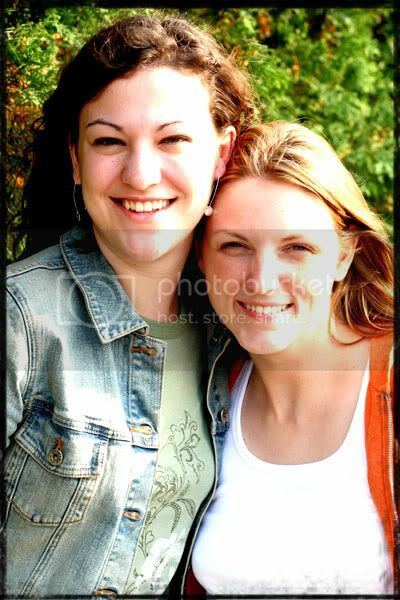 Great pic of the two of you. Can't wait to see the pumpkin patch pics! yes, i'm laughing at the nun.. can i sit next to you on the way down??? 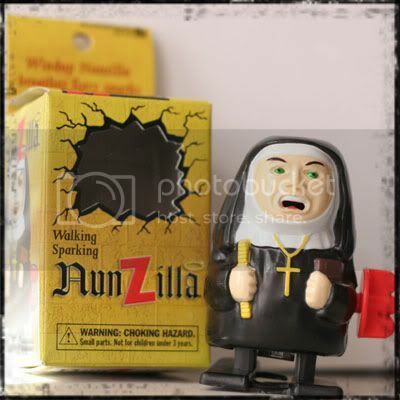 That nunzilla is hilarious! So cool that you got to meet Melanie... what a fun day!!!! so beyond fun to chill with you, E. :) i mean, you and a spark spitting nun - now that's fun! hope we can do it again soon. He-he what is it with your blog and the spam!?! They just love you :) That nun is hilarious!! Sounds like you both had a great time, pretty photo!! so cool that you got to meet! I would love to meet you someday girl! Good for you for doing the exercise each day. I need some of that motivation! Awesome photo of you guys! Sounds like you had a blast and I can't wait to see your p patch photos! I had to improvise big time this year, lol.